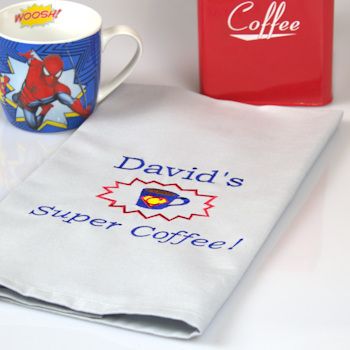 Coffee lovers personalised blue cotton tea towel embroidered with a fun Super Coffee motif and your choice of words. Light blue cotton tea towel hemmed on all sides. A good size tea towel at approx. Light blue cotton tea towel hemmed on all sides. A good size tea towel at approx. 42cm wide x 73cm long. Embroidered in royal blue, red and bright yellow super hero colours. Our example reads David's Super Coffee! however you can have any name or brief message you want in place of this! You type in the words you want embroidered.